Everyone says the kitchen is the most important room of the house and the heart of the home… family & friends love to spend time here. When a house is for up for sale, the kitchen can make or break the deal! 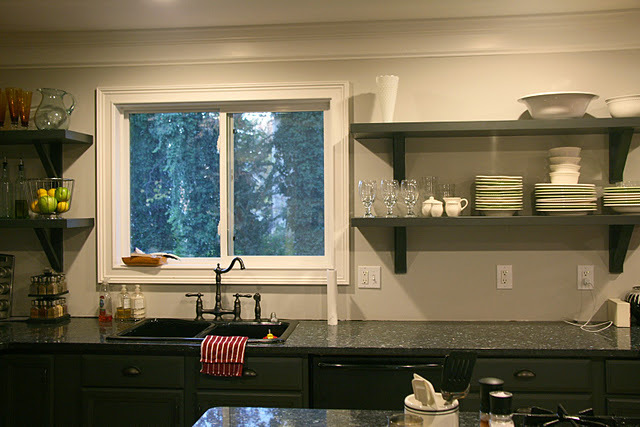 When I am called to stage a property, I frequently recommend certain cost effective changes that homeowners can do themselves prior to listing to have the kitchen show it’s best. They also happen to be great improvements for anyone with a kitchen that is past it’s prime! 1. Update the cabinets with paint. This is the most impactful change you can make. Try dark chocolate brown, cream, white or mushroom. Choose a cabinet color that contrasts with your wall color- if your walls are dark, choose a lighter color- if your walls are light, choose a darker color. No color is too dark if the space is properly lit. 2. 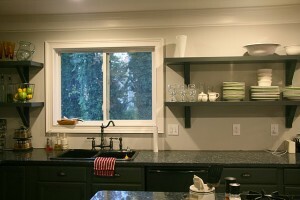 Add glass fronts to one or two upper cabinets. On many cabinet styles, you can simply pop out the center panel inset and take it to a glass company to have glass fitted & inserted. If there is no center inset in your doors, cut out a center portion, leaving a 3” frame around the edges. 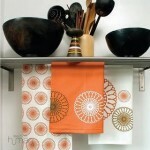 Look for interesting glass such as frosted or reeded (a modern vertical design.) 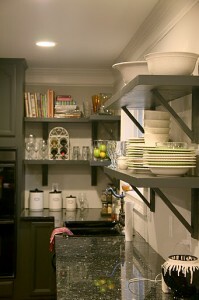 You can also paint the inside of the cabinet a beautiful accent color. 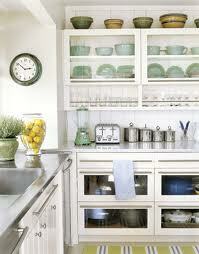 Once dry, fill with decorative dishes, glassware, or serving pieces, and reinstall the doors. 3. 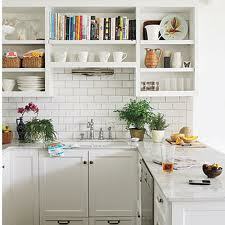 Remove an upper cabinet altogether and replace with open shelving, or take off the doors and create “open shelving”. This is a clean, modern look that can make a smaller kitchen feel really spacious. You will need to keep things arranged nicely on those open shelves, but it’s worth it when you see the fresh look this will give to your kitchen! 4. Replace the fluorescent box. Install some recessed lighting, pendant lights, a track light or a chandelier. Consider installing a dimmer for more lighting options. 5. 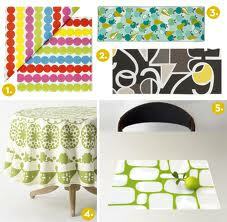 Place Cork flooring right over your old vinyl, wood or even outdated tile floor. Cork is incredible…it comes in many colors and patterns and is a very resilient and flexible floor. Plus, it’s a renewable resource. 6. Replace outdated cabinet knobs and pulls! Satin nickel, stainless, oil-rubbed bronze, or iron hardware will instantly bring new life to your old cabinetry. 7. Brighten your kitchen with new linens. Try a new table cloth and dishtowels to refresh instantly. 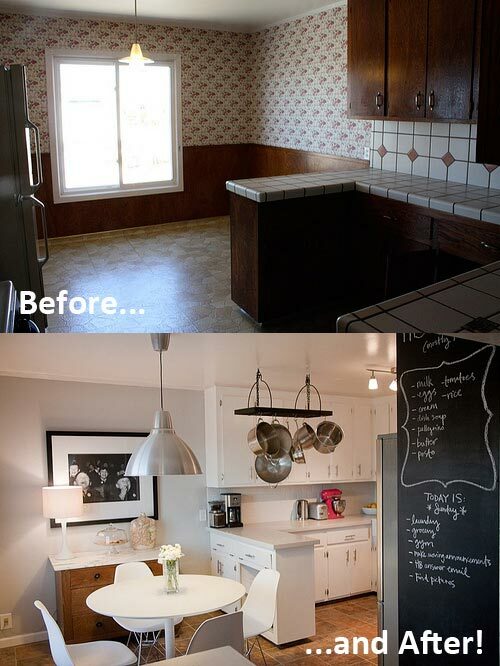 Try any combination of these ideas to dramatically transform your kitchen!